AHHH, Kayaking Michigan, one of my absolutely favorite things to do. I adore the peacefulness of the rivers, spotting wildlife, dangling my feet over the side, getting in a little exercise and enjoying tasty snacks either by myself or with friends and family. Meandering down the river is not just for the summer! Did you know you can raft in the winter too? Check it out! Discover our favorite outstanding, sometimes hidden, kayaking and canoeing locations throughout Michigan! Why paddle at the same 'ole location when you can explore new and exciting rivers and lakes? 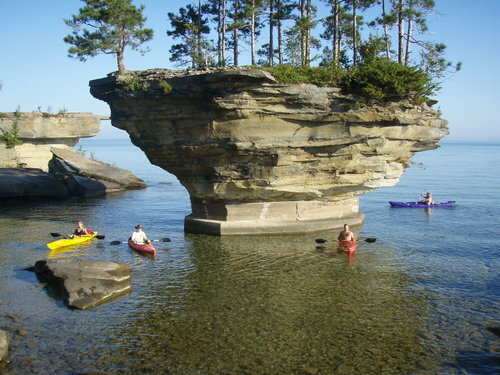 I'm feeling the need to WOW you right from the start so let's begin with one of the coolest kayaking destinations in Michigan...Turnip Rock! 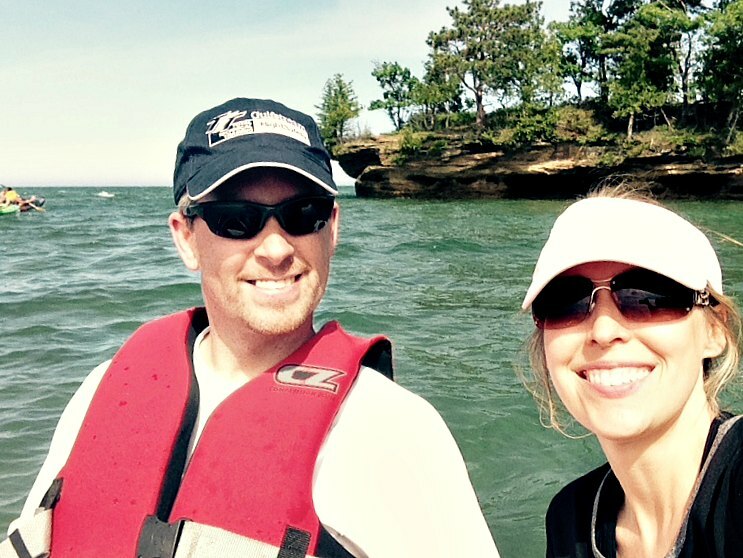 Kayaking to Turnip Rock in Port Austin, Michigan is unmistakably one heck-of-an exciting paddling trip on Lake Huron. I absolutely love the challenge and the views! PRO TIP: I don't recommend this trip for first timers as it takes work to paddle on Lake Huron and the water can be very choppy (if it's windy) near Turnip Rock. Wear your life vests! The trip out to Turnip Rock consists of a 7 mile out-and-back trip via the Point aux Barques trail. The shallow water around The Rock can be very choppy but you can get out on small nearby rocks and take some photos. The land surrounding Turnip Rock is private so be mindful to stay close to the water's edge. Be sure to wear suitable footwear if you are going to exit the kayak as the rocks are slippery. 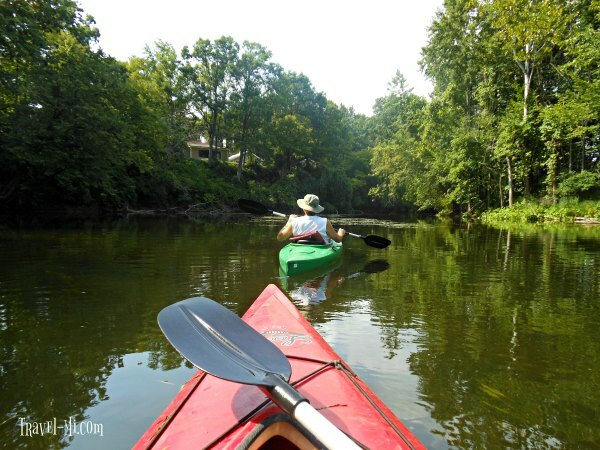 The Shiawassee River is incredibly scenic and a perfect place for canoeing and kayaking. The river is a warm-water river ecosystem with a slow-moving current so it is suitable for families. Learn more here! This is a fantastic river with slow water movement, lots of trees for shade and plenty of spots to "pull over" and enjoy lunch. Perfect for a lazy day kayaking Michigan! This is also a great river for tubing. My family and friends have kayaked this river several times and it's my mom's favorite due to the shade trees on hot summer days. 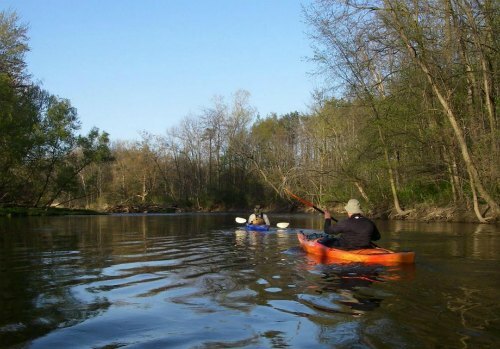 It's a great river to try out kayaking if it's your first time or you are new to the sport! The Pine River is an outstanding river adventure with white water for a paddler looking for a challenge. Definitely NOT a river for first timers unless you are up for a challenge and know your abilities. 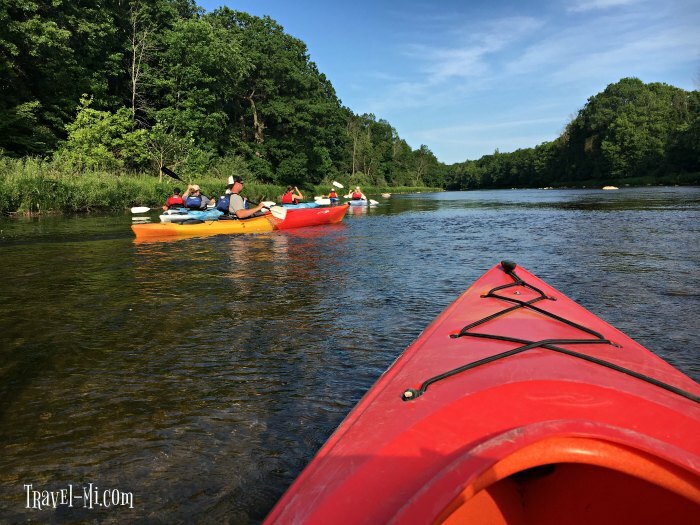 Visit the lower stretches of the river after a heavy rainfall and you'll be rewarded with plenty of white water rapids and narrow twists through Manistee County. 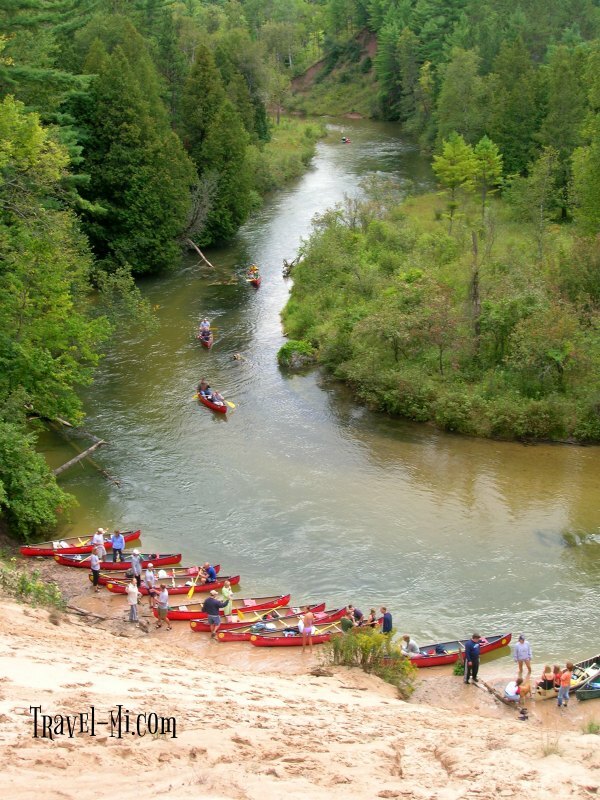 This river will show you how kayaking Michigan rocks! I adore this river as I crave excitement when paddling. My work friends and I have camped and paddling this river several times and it's one of my favorite river excursions in Michigan! This gorgeous winding river is ICE COLD all times of the year yet has stunning vistas throughout the trip. Pine River Kayaking and Canoeing Michigan. Do you see the heart? 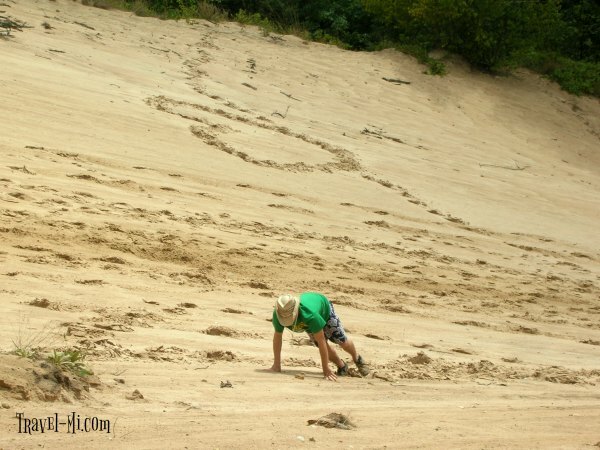 Part way through the trip you will encounter a very high sand dune that at least one person in your party MUST attempt to ascend for bragging rights. We stayed at the Pine River Paddlesports Center (9590 S. Grandview Highway S 37, Wellston, MI 49689) campground and utilized their livery services. Very nice campground with showers and flushing toilets. 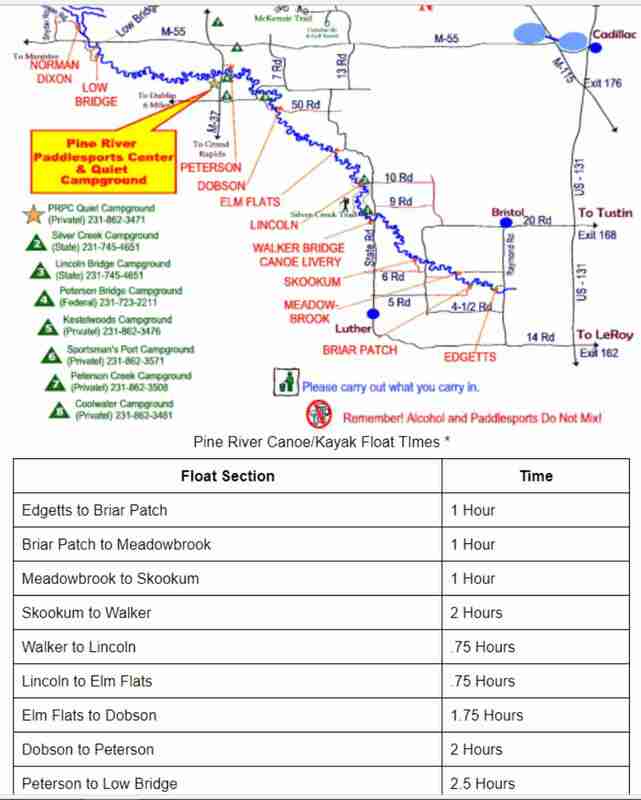 See the Pine River paddling map below for Pine River Paddlesports Center. Peterson to the Low Bridge is a great trip. Nearby is the Dublin General Store 18372 Hoxeyville Rd, Wellston, MI 49689. Be sure to stop by for an amazing assortment of jerky to take on your river outing! Visit Tippy Dam! N Tippy Dam Rd, Brethren, MI 49619. Tippy Dam is a stop we always make as I love to watch the salmon jump and see the fishermen line the edges of the dam fishing. It's a pretty cool place to visit. Enjoy a day with your friends and family canoeing or kayaking on the AuSable River. 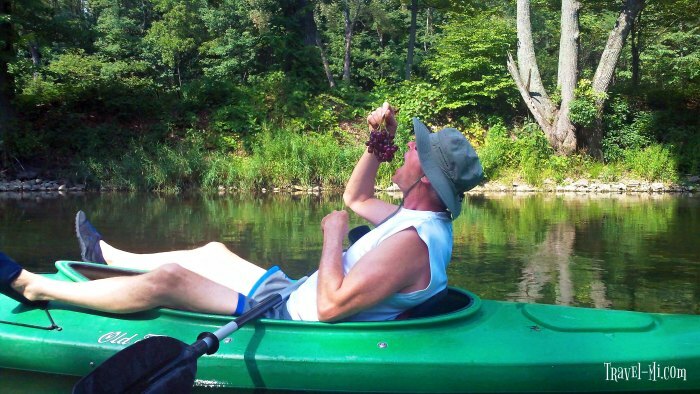 Spend the night at the family owned riverside Bed & Breakfast the night before for the true experience of Kayaking Michigan! 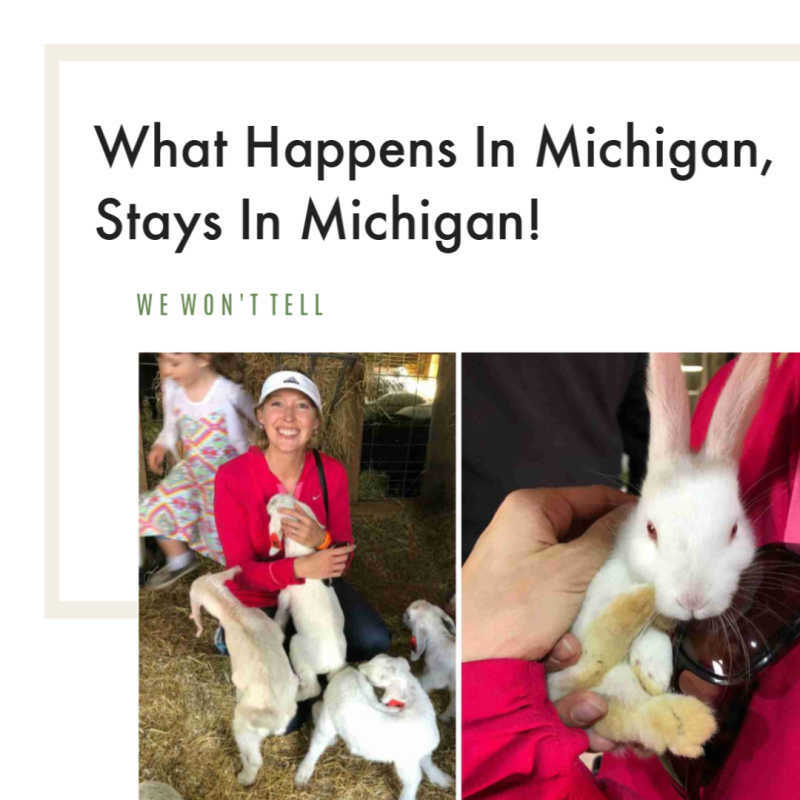 Learn more about the B & B and river adventures here! You want spectacular vistas? Well....try paddling along steep sandstone cliffs and clear waters in the world's largest freshwater lake. Pictured Rocks is located in Munising, MI. Munising is located in the Upper Peninsula of Michigan and is a great destination in itself. These spectacular rocks are stunning any time of year. Put in/take out at the Munising Falls Interpretive Center in Munising. 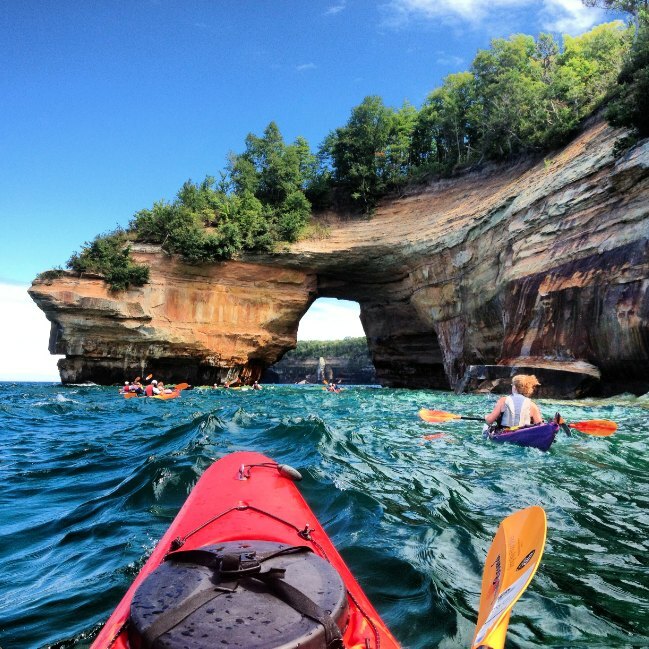 There are a variety of kayak outfitters with tours including Pictured Rocks Kayaking and Paddling Michigan. Children are welcome on the tours. Options include a Sunset Paddle, Paddle and Hike, and paddling tours ranging from 2.5 hours to 6.5 hours. Paddling Michigan has tents and cabins if you wish to stay on site. There are lots of lodging options in Munising. Get out on the Platte River for some canoeing, kayaking, stand up paddling boarding and tubing near Sleeping Bear Dunes National Lakeshore! The Platte River is a fantastic river to explore. The Lower Platte is a friendly, gentle flowing river that is perfect for the whole family. The average depth is 2-3 feet and flows through a small lake (Loon Lake). The Upper Platte is a much faster river for those wishing for a more exciting adventure. Lots of narrow quick turns so you will need to know how to maneuver well! Are you sold? 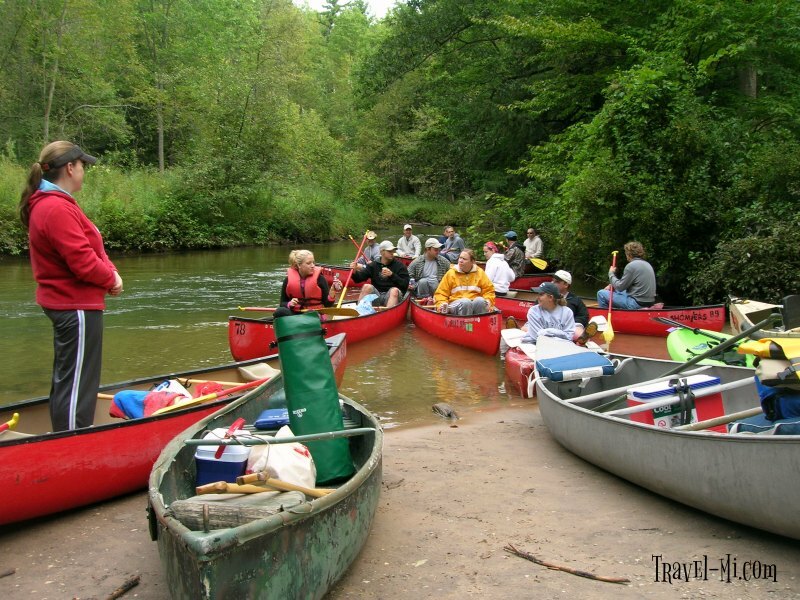 Contact Riverside Canoe Trips located 30 miles west of Traverse City between Frankfort and Empire. Address: 5042 N. Scenic Highway (M-22), Honor, MI at the Platte River Bridge. Riverside Canoe Trips also has a great general store with a full grocery line, drinks, lunch meats, snacks, clothing and more. Open May through mid October. If you are looking for a more peaceful paddle on the Lower Platte, it's best to launch around 8:30 a.m. or after 4:30 p.m. when the river is less traveled. **You will need your Sleeping Bear Dunes Pass or they sell them at their shop. Your kayaking Michigan experience wouldn't be complete without a trip to Mackinac Island! This proves there is more to The Island than fudge and horses! 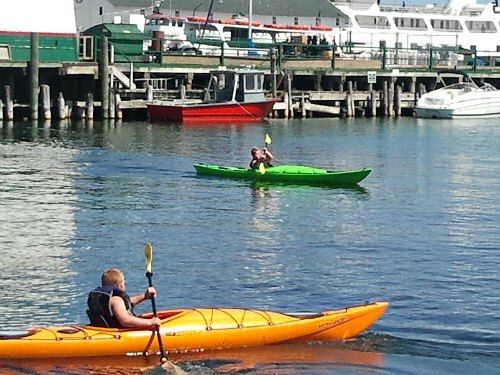 There is a wide variety of exciting kayaking tours to explore in the Mackinac Island area! Try a beautiful sunrise or sunset tour. Or enter the Straits outside the East breakwall towards Arch Rock and coast over the beautiful underwater caves and rock formations of the Rock Maze. Lots of opportunities for taking awesome photos, snorkeling and making memories. Discover all the options waiting for you here! I love paddling the Chippewa River in Midland as we routinely see eagles, turtles, deer, otter and wildlife. It's a slow moving river with few obstacles so it's great for the whole family. You may put your own kayak in at the kayak launch area near the Tridge in downtown Midland or join a paddling group with the Chippewa Nature Center. The Nature Center handles all transportation logistics so you have nothing to worry about! The Chippewa Nature Center has numerous trips in June, July and August so book a trip today! Check the Nature Center's website to see their schedule. We hope this Kayaking Michigan page gave you some inspiration of where to kayak and canoe this spring, summer and fall in Michigan! If you have your favorite and photos, please send them to us! We would love to see your adventures.